A gamut of challenges like omnichannel sales, seasonal demand fluctuation, overstocking, out-of-stock situations, back orders, order returns, and the constant strife for ever-shorter lead times create pressure for better warehouse process and operations management. As a result, a considerable number of warehouses have now adopted and many more are willing to adopt predictive analytics in warehouse management. This is not only helping them predict the future situations and requirements, but also improve warehouse operations. This article sheds light on predictive analytics as a technology, and how it can be useful for the warehousing industry. It also presents insights on where this warehouse technology solution stands as far as the modern warehousing industry is concerned. Last, but not the least, we also share our opinion on whether it’s time to adopt it already. Predictive Analytics is an offshoot of advanced analytics. As the name suggests, it is used to make predictions about future events and situations. It uses several techniques from fields like statistics, data mining, artificial intelligence, machine learning, data modeling, etc., to make predictions based on data at hand (historical and current). By applying these techniques, it creates models through predictive algorithms to give you a number that marks the probability of future events. It helps you gauge impending risks, and recognize opportunities in near and far future. It is through this technology that big data comes to be deciphered and made use of in the most apt manner possible. 70% of all data is created by individuals, but it's business that store and manage 80% of that data. Today, predictive analytics software are capable of taking digital data across the entire supply chain network, analyzing it, and predicting consumer behavior, the demand for products, as well as the risks and the opportunities in the future. For example, based on the data from the past holiday seasons, and the consumer behavior during the same, analytics tools can forecast the expected demand for each sort of product for the next holiday season, and also determine your safety level stock for the same. Demand Prediction: It lets you predict demand across multiple channels, based on consumer behavior and past demand patterns, especially in case of seasonal demand. The overwhelming volume of data that is generated in warehouses today can be used very well by forecasting analytics to help predict demand. 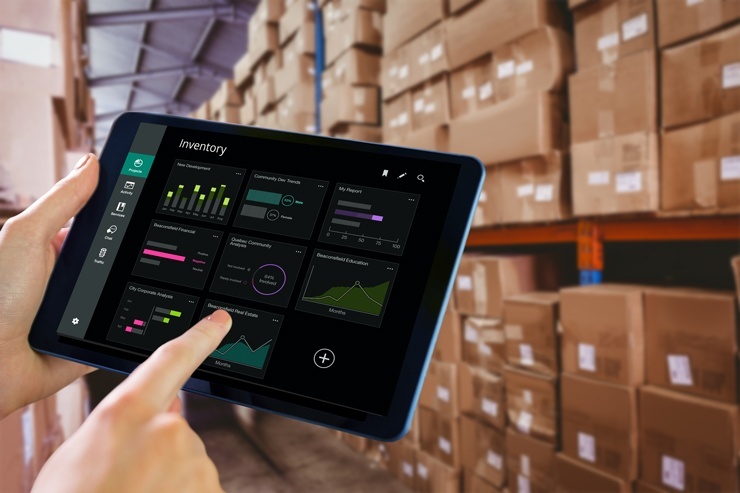 Inventory Optimization: Predictive analytics tools are now helping avert out-of-stock situations as well as overstocking by forecasting future demand for stock. Insight into consumer buying patterns helps you maintain safety stock levels and make better inventory management decisions. Data Customization/Refinement: Data analytics lets you explore and correlate data in ways that was nearly impossible before. By pulling data from different sources (ex. financials, operations, seasonal demand, etc.) and applying data analytics and modelling to this universe of information, companies can have a comprehensive approach to making better business decisions. Improved Customer Service: Predictability of demand, stock, and warehouse operations, based on consumer behavior leads to better management, and hence, better customer service. Where is Predictive Analytics Now? 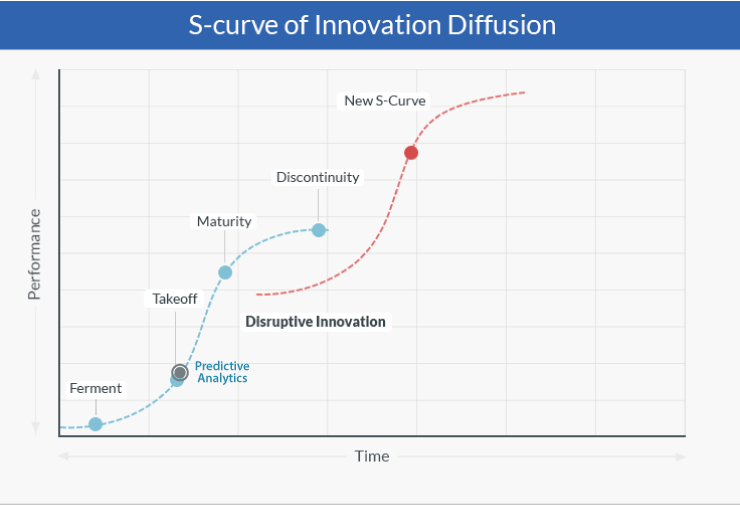 To assess if this is the right time to adopt a technology like predictive analytics in warehouse management we use three frameworks (the S Curve of Innovation Diffusion, the Technology Adoption Life Cycle and the Hype Cycle) that help us weigh risks and opportunities. We believe that predictive analytics in warehouse management has crossed the Ferment Stage and reached the Takeoff Stage, but is still far from maturity. It also means that innovation is at its highest as of now. Evidently, an increasing number of warehouses are drawing maximum benefit out of it. Supported by machine learning and predictive analytics, companies are joining the race. Soon analytics software will be a staple in warehouses. 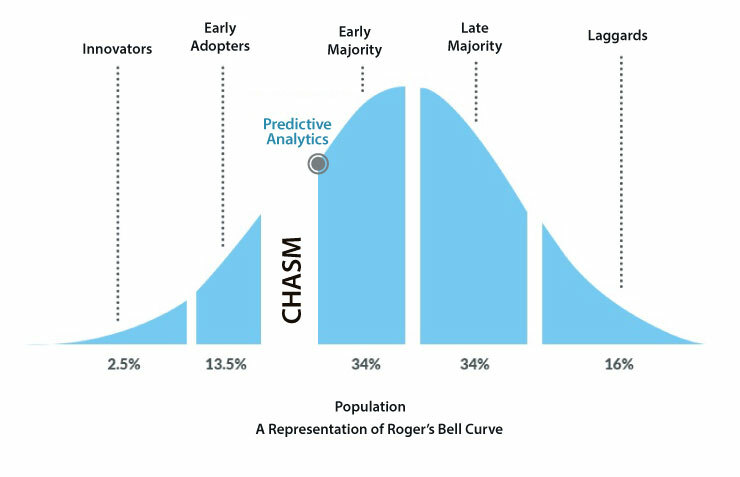 As analytics tools move ahead of the Takeoff Stage on the S-curve and cross the chasm on the bell curve, we believe that it is ready to be adopted by an Early Majority before it becomes mainstream in a matter of 1-2 years. The 2017 MHI Industry Report supports that only 17% of its respondents are using predictive analytics at the moment. Around 57% managers believe in the disruptive power of Predictive Analytics. 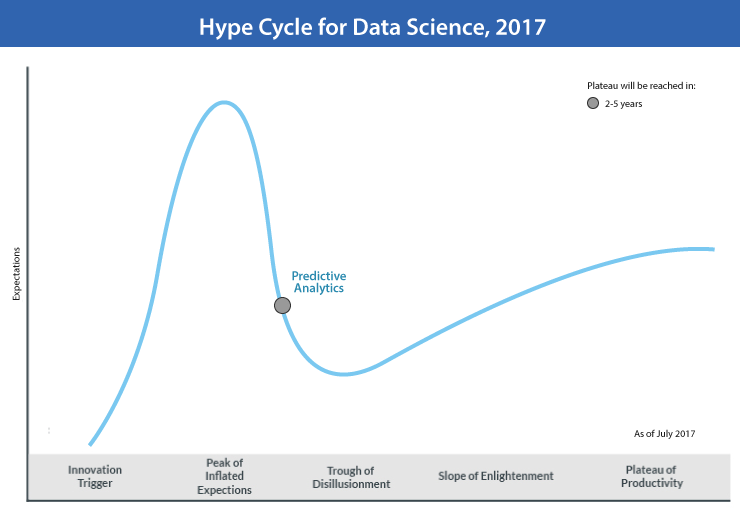 The 2017 Hype Cycle for Data Science from Gartner marks the transition of predictive analytics from the Peak of Inflated Expectations in 2016 to the Trough of Disillusionment in 2017. Gartner suggests that this technology will reach the Plateau of Productivity in 2-5 years. Its position on the Hype Cycle implies that the industry is seeing success cases on real grounds, leading to more warehouses adopting this warehouse technology. In an unstable economic scenario, the power to predict and forecast demand and consumer behavior is not only important, but also necessary. As the industry moves towards warehouse digitalization, collection and analysis of large volumes of data alone can only overwhelm you and still leave you in the lurch. 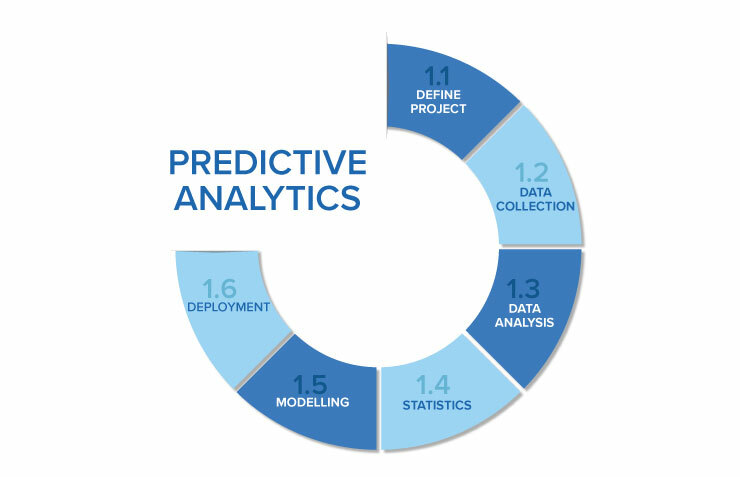 Predictive analytics is equipped to effectively manage and analyze large sets of data and help warehouse and distribution center managers make fairly accurate predictions for the future. If you are unsure about this technology, we advise you to explore and learn more about its benefits for warehouse and distribution center operations. Immensely promising as it is, considering its adoption is worth a try. As always, if there is anything else that you would like to know about this topic, or if you need some tips on warehouse technology, do not hesitate to comment. Hector has 15 years of experience leading IT operations for large and small businesses. He holds an MBA in Management and Bachelor's degree in Information Technology. Hector has a passion for books and creating opportunities for others to grow.